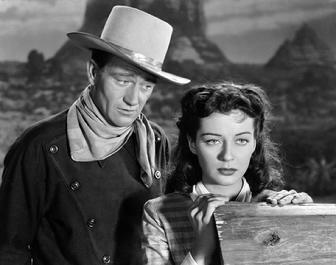 Gunman (John Wayne) puts up his guns when he falls in love with a Quaker girl (Gail Russell). Quirk (John Wayne) on horseback is being chased by gunmen who shoot at him. He outruns them, and races across gorgeous scenery in an arid landscape (Sedona & Monument Valley, Arizona)... see more here... A great western romance. Click on the image to the left or HERE to see where John Wayne and Gail Russell romanced (right here at the Cottonwood Hotel) during their filming of this classic movie! If you stay in the John Wayne Suite you can view the 'Angel & the Bad Man' on video. The town in the movie called Chuckawalla, Nevada is actually Cottonwood, Arizona. � the movie's casino and bar scenes were shot in the old Rusty's Saloon (925 N. Main), (renamed the Purple Sage during filming, Rusty kept the name). This location today houses Nic's Italian Steak & Crabhouse. � there's a chase and car crash out at the Tuzigoot Natn'l Monument location and the old Verde River bridge that got washed up in Cottonwood's 1992 (100 year) flood. Synopsis: Fritzi Haller (Mary Astor) is a powerful casino owner in Chuckawalla, Nevada. Her daughter Paula ('Lizabeth Scott) having quit school returns at the same time as racketeer Eddie Bendix (John Hodiac), who left under suspicion of murdering his wife. Paula and Eddie become involved; each for their own reasons, Fritzi, Paula's old beau Tom (Burt Lancaster), and Eddie's pal Johnny (Wendell Corey) try to break up the relationship. Then Eddie's past catches up with him in an unexpected way. 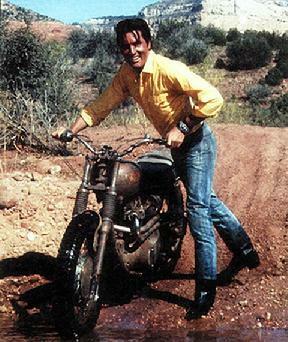 1967 Filming of 'Stay Away, Joe" starring Elvis Presley, co-starring Burgess Meredith, Joan Blondell and Katy Jurado was filmed in Cottonwood and Sedona, Arizona. The motorcycle (dirt-bike) scene is at the Verde River in Cottonwood, AZ. To see more about Elvis in Cottonwood CLICK HERE or the image on the left. The movie was released in 1968. Western pardners find a baby boy in an otherwise deserted emigrants' camp, and clash over which is to be "father." Stars William Boyd, Clark Gable. Phoebe Titus is a tough, swaggering pioneer woman, but her ways become decidedly more feminine when she falls for California bound Peter Muncie. Stars Jean Arthur, William Holden. The Flying Tigers are a band of American Mercenaries called upon by China to help fight the Japanese two years before Pearl Harbor. Stars John Wayne. A husband and wife on America's frontier. Stars Katherine Hepburn, Spencer Tracy. Dunson is driving his cattle to Red River when his adopted son turns against him. Stars John Wayne, Montgomery Clift. When a shady-looking stranger rides into town to join his old friend it is assumed he is a hired gun. Stars Robert Mitchum, Barbara Bel Geddes, Robert Preston, Walter Brennan. A performing sharpshooter is asked to help a beleaguered group of copper miners. Stars Ray Milland, Hedy Lamarr, Macdonald Carey, Harry Carey, Jr. Though David has all the wealth, power, wives & children inherent for the King of Israel he does not have what he craves most: the true love of a woman who loves him as a man instead of as King. Stars Gregory Peck, Susan Hayward. Rodeo rider's marriage is endangered because of his commitment to the sport. Stars Gig Young, Polly Bergen, Harry Morgan. Following the surrender of Geronimo the last Apache warrior is captured. Stars Burt Lancaster, Charles Bronson. A couple of young cowboys win the hearts of their sweethearts. Stars Gordon MacRae, Gloria Grahame. After outlaw leader is captured in a small town, his gang continues to threaten. Stars Glenn Ford, Van Heflin. Wyatt Earp decides to quit being a lawman and join his brothers in Tombstone, Arizona. Starring: Burt Lancaster, Kirk Douglas. Chappy discovers a drug-smuggling scheme at his own air base. Stars Lou Gossett, Jr.
Two families feud over water rights, and peace is brought about only with the deaths of the family heads. Stars Gregory Peck, Jean Simmons, Carroll Baker. A small-town sheriff in the American West enlists the help of a cripple, a drunk, and a young gunfighter in his efforts to hold in jail the brother of the local bad guy. Stars John Wayne. Eleven friends who know each other from World War II plan to rob five of the biggest casinos in Las Vegas. Stars Frank Sinatra and Dean Martin. The Cravet family builds their newspaper Oklahoma Wigwam into a business empire. Stars Glenn Ford. The Alfred Hitchcock classic about strange goings-on at the Bates Motel. Stars Anthony Perkins, Janet Leigh. The history of Western expansion in the United States. Stars Henry Fonda, Lee J. Cobb. No dialogue--just images and music. A family adventure film. Rex Allen, Narrator. Cattle baron fights his wife, his daughter, and political land-grabbers. Stars John Wayne. To improve his social life, a nerdish professor drinks a potion that temporarily turns him into the handsome, but obnoxious, Buddy Love. Stars Jerry Lewis. An ex-Raider who's let out of jail with buddy are deputized as Arizona Rangers to hunt down the remnant of the gang, rumored to he hiding out in a town "neer dee border". Stars Audie Murphey. A cargo plane goes down in a sandstorm in the Sahara with less than a dozen men on board. Stars James Stewart, Richard Attenborough. Hired gunman turns down a job with Bart Jason as it would mean having to fight an old sheriff friend. Stars John Wayne, Robert Mitchum. Man is innocently accused of having stolen a cannon from the Mexican revolutionary forces. Stars Elvis Presley. Two long-haired bikers from Los Angeles take off on a cross-country trip. Stars Peter Fonda, Dennis Hopper. A gangster kidnaps Marshal McKenna because he believes that he has seen a map which leads to a rich vein of gold in the mountains. Stars Gregory Peck, Omar Sharif, Telly Savalas. Loony woman lures housekeepers to her desert home to kill them and steal their savings. Stars Geraldine Page, Ruth Gordon. An ex-union officer teams up with a couple of ex-Johnny Rebs to search for the traitor whom sold information to the south during the civil war. Stars John Wayne. Ex-Green Beret karate expert saves wild horses from being slaughtered for dog food and helps protect a desert "freedom school" for runaway. Stars Tom Laughlin. Stars Bob Hope, Eva Marie Saint, Ralph Bellamy, Forrest Tucker, Chief Dan George, Anne Archer, Keenan Wynn. Joe Kidd is a former bounty hunter and all-around tough-guy in the American Southwest during the Mexican-American War. Stars Clint Eastwood, Robert Duvall. An over the hill rodeo rider has problems adjusting to the complexities of modern life. Stars Steve McQueen, Robert Preston, Ida Lupino. An Arizona ranch is overrun with scary rabbits. Stars Janet Leigh, Rory Calhoun, DeForest Kelly. Something beyond comprehension is happening to a little girl. Stars Ellen Burstyn, Max von Sydow, Lee J. Cobb, Linda Blair. A recently widowed woman on the road with her precocious young son, determined to make a new life for herself as a singer. Stars Ellen Burstyn. A story of the U.S. Army's experiment with using camels in the southwest. Stars Slim Pickens, Denver Pyle. Josey Wales makes his way west determined to live a useful and helpful life. He joins up with a group of settlers who need the protection that a man as tough and experienced as he is can provide. Stars Clint Eastwood, Sondra Locke, Chief Dan George. A rock star helps a singer achieve stardom. Stars Barbra Streisand, Kris Kristofferson, Gary Busey. An unemployed construction worker heading out west stops at a remote farm in the desert to get water when his car overheats. Stars Sidney Poitier. Streets are overrun by killer spiders, trapping a small group of towns folk in a remote hotel. Stars William Shatner. Polish rabbi comes to America and befriends a bank robber. Stars Gene Wilder, Harrison Ford. Used car salesman needs money to run for State Senate. Stars Kurt Russell, Jack Warden. A wide variety of eccentric competitors participate in a wild and illegal cross-country car race. Stars Burt Reynolds, Roger Moore, Farrah Fawcett, Dom DeLuise, Dean Martin, Sammy Davis, Jr.
A complete innocent is drawn into a web of secrecy and government secrets when the sister of man who has committed suicide gets into a taxi-cab with him. Stars Gene Wilder, Gilda Radner. The Griswold family's cross-country drive to the WallyWorld theme park proves to be much more arduous than they ever anticipated. Stars Chevy Chase, Beverly D'Angelo, Imogene Coca, Randy Quaid, Anthony Michael Hall. At a big campus, a group of bullied outcasts and misfits resolve to fight back for their peace and self respect. Stars Robert Carradine, Anthony Edwards, Timothy Busfield. Guy driving a '55 Thunderbird on Route 66 hooks up with another guy after hoodlum and his gang shoot his car. Stars Willem Dafoe, Judge Reinhold. A divorced woman with a teen aged boy moves into a small town and tries to make a go of a horse ranch. Stars Sally Field, James Garner. Three unemployed actors accept an invitation to a Mexican village to replay their bandit fighter roles, unaware that it is real thing. Stars Chevy Chase, Steve Martin, Martin Short. Flashbacks of a young person's coming of age. Stars Annabeth Gish, Jon Voight, JoBeth Williams, Ellen Barkin. After several failed suicide attempts a lonely and miserable woman has given away her baby for adoption - and regrets it now. Stars Rosanna Arquette, Eric Roberts, Mare Winningham. The Freeling family have a new house, but their troubles with supernatural forces don't seem to be over. Stars JoBeth Williams, Craig T. Nelson, Heather O'Rourke. When a childless couple of an ex-con and an ex-cop decide to help themselves to one of another family's quintuplets, their lives get more complicated than they anticipated. Stars Nicolas Cage, Holly Hunter. Kid hires the prettiest cheerleader in school to be his girlfriend. Patrick Dempsey. Three more anthology-type tales of terror. An accountant is chased by bounty hunters, the FBI, and the Mafia after jumping bail. Stars Robert De Niro, Charles Grodin. Two seemingly dumb teens struggle to prepare a historical presentation with the help of a time machine. Stars Keanu Reeves, George Carlin. An exotic dancer marries the owner of a baseball club. He does not survive the honeymoon and she is in control of his ball club. Starring: Tom Berenger, Charlie Sheen, Rene Russo, Wesley Snipes. Fighting drug cartels with air-to-air combat missions. Stars Nicolas Cage, Tommy Lee Jones. A young hot-shot stock car driver gets his chance to compete at the top level. Stars Tom Cruise, Robert Duvall, Nicole Kidman, Randy Quaid. When a woman's son is hospitalized after an unsuccessful con job and resultant beating, she finds that even an absentee parent has feelings for her child. Stars Angelica Huston, John Cusack, Annette Bening. People in L.A. try to make connections with each other and be good people. Stars Danny Glover, Kevin Kline, Steve Martin. An educational film about the creation of this natural wonder. An educational film exploring the beauty of four states, including Arizona. A convicted wife murderer returns 22 year later to seek revenge on the daughter who help convict him. Stars Donald Sutherland, Amy Irving. Two slacker friends try to promote their public-access cable show. Stars Mike Myers, Dana Carvey. Rated R.
Undercover cop joins a murderous, arms-dealing biker gang to try to put them behind bars. Stars Charlie Sheen. Brothers meet for the first time after their father's funeral and remark on how similar they look. One is plotting to kill the other and pass the corpse off as his own, to start a new life with his father's inheritance. Stars Dennis Haysbert, Mel Harris. Explores the relationship between physics and the characters. Stars Phoebe Cates, Bridget Fonda, Tim Roth, Eric Stolz. After success cleaning up Dodge City, Wyatt Earp moves to Tombstone. Stars Kurt Russell, Val Kilmer, Sam Elliott, Bill Paxton, Dana Delaney. Based on a true story of a man in Arizona who believes he was abducted by aliens. Stars D. B. Sweeney. Rated PG-13. An Innuit hunter races his sled home with a fresh-caught halibut. Stars Johnny Depp. Multi-award winning film about a young man's travels across America. Stars Tom Hanks. 1993. Rated R.
Action/adventure film about a gangster and his wife. Stars Alec Baldwin and Kim Basinger. Rated R.
An action comedy with a detective theme. Stars Keenan Ivory Wayans and Jada Pinkett. Rated R.
A mysterious gunfighter left nearly blind from Civil War combat, roams through Mexico with a baby he has sworn to protect. Stars Armand Assante, Elizabeth Shue. Comedy-drama-adventure about three women traveling across the country. Stars Whoopi Goldberg, Drew Barrymore, Mary-Louise Parker. An Australian outlaw in the wild west. Stars Paul Hogan, Cuba Gooding, Jr., Beverly D'Angelo. Bret Maverick, needing money for a poker tournament, faces various comic mishaps and challenges, including a charming woman thief. Stars Mel Gibson, Jodie Foster, James Garner. A violent film about mass murderers and the media that loved them. Stars Woody Harrelson, Robert Downey, Jr. Rated R.
An absent-minded-professor father and his son bond during a symbolic road trip through the Western U.S. while his wife tries to overcome her neuroses to save the family. Stars Ted Danson, Mary Steenburgen. An interstellar teleportation device, found in Egypt, leads to a planet with humans resembling ancient Egyptians who worship the god Ra. Stars Kurt Russell, James Spader. A western drama about a beautiful gunslinger. Stars Sharon Stone, Gene Hackman, Leonardo DiCaprio.Rated R.
Unsuspecting guy becomes involved with Russian mafia. Action/adventure. Stars Charlie Sheen, Nastassja Kinski. Rated PG-13. 3-hour movie traces the life of Wyatt Earp. Stars Kevin Costner, Dennis Quaid, Gene Hackman.Rated PG-13. A priest who lost his faith becomes a cop instead. Stars Elias Koteas, Christopher Walken. Rated R.
High grossing adventure movie includes pilots, aircraft, nuclear bombs and such. Stars John Travolta, Christian Slater.Rated R.
Somewhat controversial film appealing more to women than men, explores male-female relationships. Stars Whitney Houston, Angela Bassett. Rated PG-13. Matt and Louisa are tricked into falling in love by their fathers, who pretend to feud. Stars Joel Gray. Man departs on a mission of discovery dragging his wife and 4 month old son behind. Stars Ben Stiller, Patricia Arquette, Tea Leoni, Alan Alda, Mary Tyler Moore. Blockbuster comedy/romance about a sports agent and an accountant with a cute kid. Stars Tom Cruise, Renee Zellweger, Cuba Gooding, Jr. Rated R.
The luxurious villa of a yuppie couple is overrun by loads of uninvited guests who turn the house up side down. Stars Kirstie Alley. A star-studded spoof of science fiction movies. Stars Jack Nicholson, Glenn Close, Annette Bening. PG-13. An old rodeo cowboy picks up a young, female hitchhiker. Stars Tom Selleck, Rebekah Johnson, JoBeth Williams. Made for TV. Rated PG-13. The crew tries to keep Earth's past and present in tact. Patrick Stewart, Jonathan Frakes. Rated PG-13. Romantic comedy in a golf setting. Stars Kevin Costner and Rene Russo. Rated PG-13. Slapstick comedy with the Griswold family. Stars Chevy Chase and Beverly D'Angelo. Rated PG. A drifter becomes entangled with a femme fatale and her husband after his car breaks down in their small Southwest town. Stars Sean Penn, Nick Nolte, Jennifer Lopez. Rated R.
Dr. Ellie Arroway finds conclusive radio proof of intelligent aliens, who send plans for a mysterious machine. Stars Jodie Foster. Rated PG. A futuristic sci-fi movie about a postal delivery man. Stars Kevin Costner. Rated R.
Science fiction comedy western. Stars Will Smith, Kevin Kline, Kenneth Branagh. Rated PG-13. A young female embezzler arrives at the Bates Motel which has terrible secrets of its own. Stars Vince Vaughn, Ann Heche, Julianne Moore, William H. Macy, Viggo Mortenson. Rated R.
Acclaimed Gulf War action film. Stars George Clooney, Mark Wahlberg and Ice Cube. Rated R.
Comedy spoof about organized crime. Stars Lloyd Bridges, Christina Applegate. Rated PG-13. A dark, comedic thriller about fraud, bank robbers and a search for love. Stars Lou Gossett, Jr. Rated R.
A man must avenge his father's murder to receive $3 million. Also known as "The Day October Died." Stars Tom Arnold. A French Foreign Legion soldier, who on an archaeological dig at the ancient city of Hamunaptra accidentally awakens the Mummy. Stars Brendan Fraser. Rated PG-13. A small village off the mainland is about to receive a huge winter storm. Stars Timothy Daly. Rated PG-13. Romantic comedy. Timothy Daly, Olivia D'Abo. Rated R.
A Marshal in the desolate Tucson territory of the early 1900's. Stars Dwight Yoakam, Billy Bob Thornton, Bridget Fonda. Rated R.
Comedy about a widow's post-traumatic obsession with a soap star. Stars Morgan Freeman, Renee Zellweger, Chris Rock, Greg Kinnear. Rated R.
A high school boy is given the chance to write a story about a rock band as he accompanies it on a concert tour. Stars Billy Crudup and Frances McDormand. Rated R.
The Flintstones and the Rubbles go on a trip to Rock Vegas. Stars Mark Addy and Stephen Baldwin. Rated PG. A judge is appointed to spearhead America's escalating war against drugs, only to discover that his teenage daughter is a heroin addict. Stars Michael Douglas, Catherine Zeta-Jones. Rated R.
While they're on vacation in the Southwest, woman finds out her man spent their house money on a classic car, so she dumps him, hitching a ride to Vegas for a flight home. Stars Jamie Foxx, Nia Long. Rated PG-13. 2000 - What Planet Are You From? To save his planet, an alien must find a woman on Earth to have his baby. Stars Gary Shandling, Annette Bening, John Goodman, Greg Kinnear. Rated R.
A romantic comedy about two trashy couples traveling to Reno to see a monster truck show. Stars Patrick Swayze, Billy Bob Thornton. Rated R.
Name changed from "Arac Attacks." A variety of horrible poisonous spiders get exposed to a noxious chemical which causes them to grow. Stars David Arquette. Rated PG-13. An alien organism has been rapidly evolving ever since its arrival on Earth inside a meteor. Stars David Duchovny, Julianne Moore. Rated PG-13. A young man battles vampires. Rated R.
An astronaut lands on a planet inhabited by human-like apes, who rule the planet. Stars Mark Wahlberg, Tim Roth. PG-13. An adaptation of the cult memoir of game show impresario Chuck Barris. Stars Sam Rockwell, Drew Barrymore. Rated R.
An engineer creates the ultimate weapon in a battle against aliens. Gary Sinise, Madeline Stowe. Rated PG-13. It began as a wish, became an adventure, and ended as the ultimate road trip. Stars Gary Oldman. Two U.S. Marines in WWII are assigned to protect Navajo Marines who know a secret radio code. Stars Nicholas Cage. Rated R.
Bruce Banner, a genetics researcher with a tragic past, suffers an accident that causes him to transform into a raging green monster when he gets angry. Stars Eric Bana, Jennifer Connelly, Nick Nolte, Sam Elliott. Rated PG-13. The Angels investigate a series of murders that occur after the theft of a witness protection profile database. Stars Cameron Diaz, Drew Barrymore, Lucy Liu, Bernie Mac. Rated PG-13. The comedic stylings of four funnymen in this documentary. Stars Jeff Foxworthy, Bill Engvall, Heidi Klum. Rated R.
A small-town woman tries to achieve her goal of becoming a flight attendant. Stars Gwyneth Paltrow, Christina Applegate. Rated PG-13. A free-thinking art professor teaches conservative 50's Wellesley girls to question their traditional societal roles. Stars Julia Roberts, Katherine Ann Watson, Kirsten Dunst, Julia Stiles, Maggie Gyllenhaal. Rated PG-13. A girl from a small town goes to Los Angeles to spend the summer at a performing arts high school. Stars Hilary Duff, Oliver James, David Keith, Rebecca De Mornay. Rated PG. A dozen years in the lives of two best friends who couldn't be more different. Stars Andrew Chalmers, Ryan Donowho. Rated R.
A feisty taxicab driver has hot tips for an inept cop set on solving a string of New York City bank robberies. Stars Queen Latifah, Jimmy Fallon. Rated PG-13. Based on a former Marine's best-selling book about his pre-Desert Storm experiences in Saudi Arabia and fighting in Kuwait. Stars Jake Gyllenhaal, Jaimie Foxx. Rated R.
A transsexual learns that she fathered a son, now a teenage runaway hustling on the streets of New York. Stars Felicity Huffman, Elizabeth Peña. Rated R.
A family determined to get their young daughter into the finals of a beauty pageant take a cross-country trip in a VW bus. Stars Abigail Breslin, Greg Kinnear, Alan Arkin, Toni Collette. Rated R.
In 1966, Texas Western coach Don Haskins led the first all-black starting line-up for a college basketball team to the NCAA national championship. Stars Josh Lucas, Derek Luke, Jon Voight. Rated PG. A recently released convict seeks vengeance against his former partner who set him up for murder more than 20 years ago. Stars Richard Roundtree, Robert Loggia. Rated R.
In this documentary Vince Vaughn and four stand-up comedians travel the country and perform in 30 cities. Stars Vince Vaughn, Ahmed Ahmed. Rated R.
Former superhero is called back to work to transform an unlikely group of kids into superheroes at a private academy. Stars Tim Allen, Courteney Cox, Chevy Chase. Rated PG. After graduating from Emory University, a young man abandons his possessions, gives his entire savings to charity and goes to Alaska to live in the wilderness. Stars Emile Hirsch, Marsha Gay Harden, William Hurt, Jena Malone. Rated R.
A team of U.S. government agents is sent to investigate the bombing of an American facility in the Middle East. Stars Jaimie Foxx, Chris Cooper, Jennifer Garner. Rated R.
A Las Vegas magician who can see the future is pursued by FBI agents seeking to use his abilities to prevent a nuclear terrorist attack. Stars Nicolas Cage, Julianne Moore. Rated PG-13. A sister and brother care for their ailing father. Stars Laura Linney, Philip Seymour Hoffman. Rated R.
An ancient struggle re-erupts on Earth between two extraterrestrial clans, the heroic Autobots and the evil Decepticons, with a clue to the ultimate power held by a young teenager. Stars Shia LaBeouf, Megan Fox, Jon Voight. Rated PG-13. A couple who is expecting their first child travel around the U.S. in order to find a perfect place to start their family. Stars John Krasinski, Maya Rudolph, Jeff Daniels. Rated R.
Deception forces return to Earth after the young hero learns the truth about the origins of the Transformers. Stars Shia LaBeouf, Megan Fox. Rated PG-13.